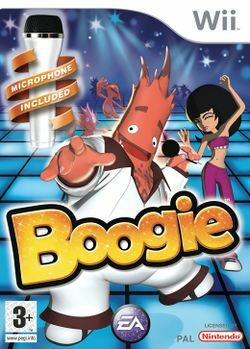 Boogie is a two-player interactive game in which players take control of their very own 'Boog' and through the use of the Wii controller, earn gold medals by dancing their way to stardom. This game also comes with a microphone to allow players to sing along with the characters in a karaoke subgame. The game also includes a video editor so that you can combine the dance moves and karaoke into a music video. The majority of the dance moves are performed by swinging the Wii controller back and forth or up and down. When is held down, a combo move is displayed that, if performed correctly, will cause your Boog to perform a special move. The on the nunchuk controller or on the Wii remote is used to move your Boog across the stage. While pressing , the can be used to 'strike a pose' and the button can be used to make the Boog's mouth open and close. This page was last edited on 4 June 2009, at 02:16.